In the album Rooms of the House, Jordan Dreyer from La Dispute wrote, with striking clarity, the emotional entanglement objects have on their owners. This is especially resonant in the album’s final track, “Objects in Space”, in which the estranged husband carefully laid out the paraphernalia of his broken relationship on the carpet, as he pondered and grieved. Reminiscing with muted sorrow about the memories of their previous life together, the man moved and rearranged these objects quietly with no rhyme or reason, sitting there for hours. Mourning, perhaps. And like a final act of a memorial, he gradually packed them into boxes. 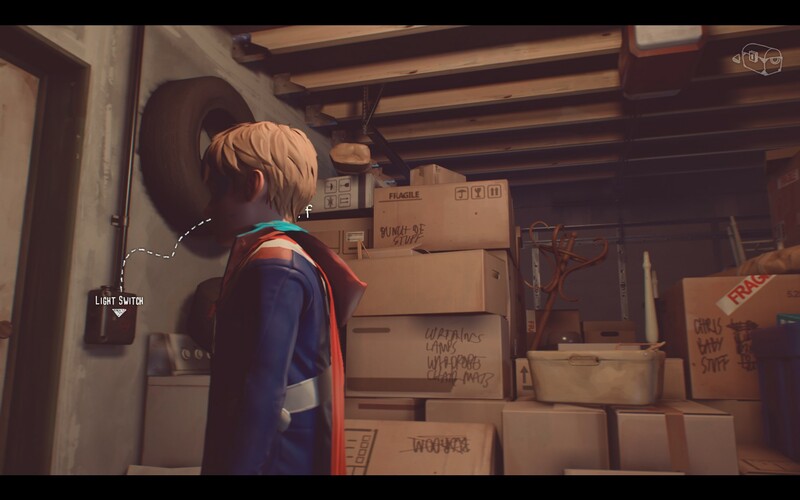 So what struck me most about The Awesome Adventures of Captain Spirit was the presence of all these cardboard boxes in the Eriksen family home, either tucked away in inconspicuous corners of the living room and bedroom, or occupying the entirety of the storeroom and garage. These are mostly filled with the belongings of Emily Eriksen, the mother of a young, likeable boy named Chris, and the wife of Charles, an ex-basketball player fired from his job. Emily was an immensely talented artist who passed away in an unfortunate car accident years ago, and it’s clear that these artifacts are kept out of sight on purpose; their mere presence would have evoked painfully powerful memories that Charles felt that he couldn’t cope with. These days, he douses himself in alcohol whenever he can, often crumpling into a drunken stupor while his son dutifully cleans up after his mess. 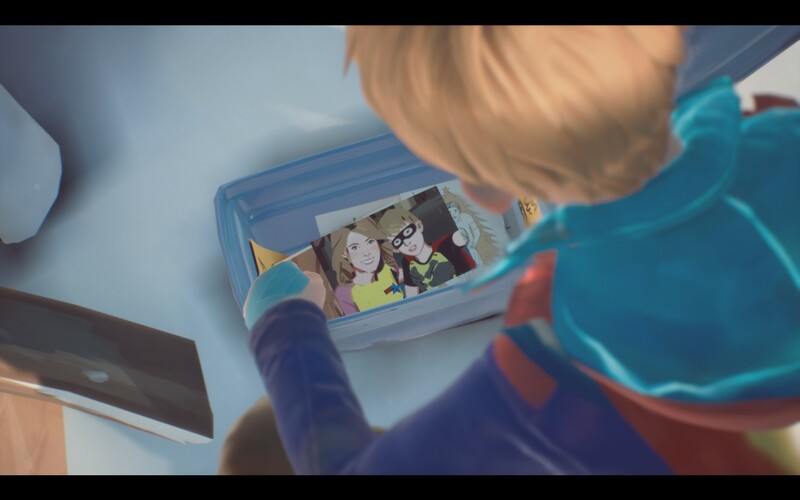 Like its predecessor Life Is Strange, The Awesome Adventures of Captain Spirit encourages players to examine and interact with its objects and spaces, letting us glean insights into the family’s most intimate affairs. Yet, with the game so immaculately adorned with details, it’s somehow even more affecting in this short episode. For instance, Charles’ attempts to bury the painfully haunting reminders of his wife is evident in his largely empty bedroom. A discolored patch on the wall above his bed indicated a previously hung photograph. His closet only has the barest of clothes, while Emily’s vinyl records lay in yet another cardboard box next to a chair. The only objects that are in abundance are discarded beer cans, strewn across every nook and cranny in his room. These are foreboding signs of his precarious emotional state, and it wasn’t surprising to see him cruelly lash out at his son in the game’s final moments. In contrast, Chris’ vibrant bedroom walls are plastered with colorful drawings and posters of heroes and villains. His comic books, given to him by his mother, are proudly displayed on his shelf, while his toys are playfully scattered across the floor. But there are also mementos of his mother he has stashed away in boxes, albeit fastidiously hidden in a plastic lunchbox or inside an abandoned cupboard he has salvaged. 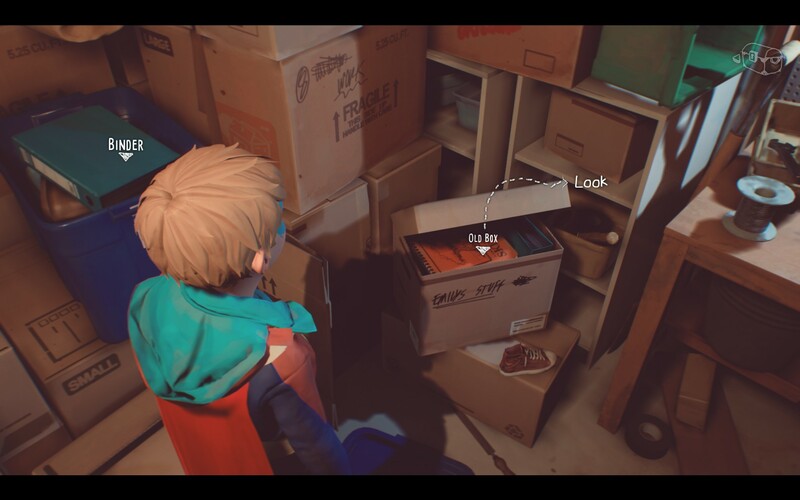 Unlike the cardboard boxes that are so prevalent in this house—their items mostly stashed, discarded and forgotten—Chris’ boxes are treasures chests in his make-believe world of superheroic adventures, frequently revisited within his imaginary escapades. Objects carry with them an innately human connection; although we did not witness their moments together, it’s impossible not to feel a sharp pang of sadness when seeing the pictures of Chris’ late mother and her doodles of their lazy Saturday afternoons. But in Captain Spirit, what’s left behind when these items are taken away also conjures an achingly compelling narrative. Even in empty spaces, we are able to recall objects that use to reside there, provoking explicit memories of the past. “Episodic memory allows us to travel back in time to relive previous events from a first-person perspective. Remembering depends on the interaction between retrieval cues and stored memories,” said Mikael Johansson, a professor at the department of psychology in Sweden’s Lund University. So that’s why even when Charles desperately tries to scrub away the memories of his deceased wife by concealing the accouterments of their relationship, he still finds himself unable to move on. And in one poignant scene, as Chris hangs out in his tree house, whiling the hours away as a wistfully melancholic Sufjan Stevens song plays in the background, he may be reliving happier days in his head as he stares down at the now-empty yard.